Oilcrash.com: New Zealand Government wakes up? NEW ZEALAND GOVERNMENT WAKES UP? Or John Keys Daughters for that matter? At least they have bought the date of peak somewhat closer than 2035 ish, as they have been saying for the past 10 years. Oil is the lifeblood of modern civilisation. This paper provides an overview of the global oil market. In particular, it examines the outlook for oil supply and demand over the next five years, and the economic consequences. Low-cost reserves of oil are being rapidly exhausted, forcing oil companies to turn to more expensive sources of oil. This replacement of low-cost sources of oil with higher-costs sources is driving the price of oil higher. While the world will not run out of oil reserves for decades to come, it cannot indefinitely continue to produce oil at an increasing rate from the remaining reserves. Forecasts indicate that world oil production capacity will not grow or fall in the next five years while demand will continue to rise. If oil production capacity does not rise as fast as demand, the buffer of spare production capacity disappears. In such a supply crunch the price of oil spikes to high levels. High oil prices can induce global recessions. Organisations including the International Energy Agency and the US military have warned that another supply crunch is likely to occur soon after 2012 due to rising demand and insufficient production capacity. Key export-generating industries in the New Zealand economy including tourism and timber, dairy, and meat exports are very vulnerable to oil shocks because of their reliance on affordable international transport. The worlds oil production capacity may not be sufficient to match growing demand in coming years. The potential for short-falls arises from geological, infrastructure, and political/economic constraints limiting the ability of world oil production capacity to grow while demand continues to rise. If oil supply cannot meet demand a price spike may be triggered, with major detrimental effects on economies, especially those heavily dependent on oil imports like New Zealand. Not all oil is the same. The source and the quality vary. 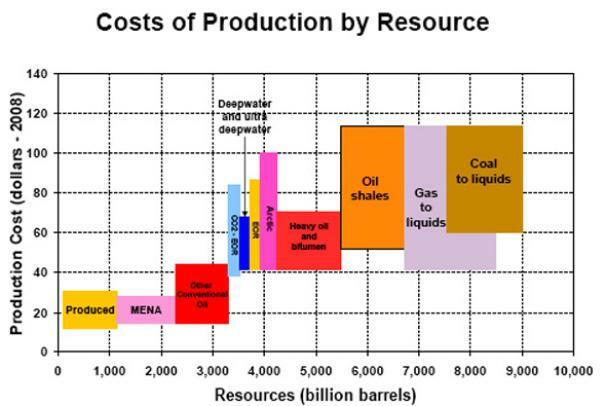 The graph below shows approximate oil reserves divided by type of reserve and production cost. Not all the oil that is thought to be in the ground has been found. The key measure of discovered oil is proven reserves (also called proved reserves), which is the amount of oil in a given field that the owner is 90 percent confident is present and can be extracted with existing technology. 8 As of 2009, the official total of proven reserves worldwide, including non-conventional reserves, stood at 1.25 trillion barrels of conventional oil and 150 billion barrels of Canadian oil sands. 9 At the rate of production forecast by the United States Energy Information Agency, 10 proven reserves would be sufficient to meet world demand for another 25-32 years, providing that oil production capacity can continue to expand. The diagram below illustrates the worlds oil reserves, along with the average daily additions to and the consumption of those reserves. On average, discoveries add 30 million barrels per day (mb/d) to proven reserves. Technological improvements, which mean that a higher percentage of the oil in reserves can be extracted than in the past add, another 25 mb/d. Discoveries and technological improvements are not enough to offset the drain on those reserves of 86 mb/d. Net reserves are decreasing by about 30 mb/d, meaning there is enough oil with current reserves, rate of production and rate of discovery to last about 80 years. 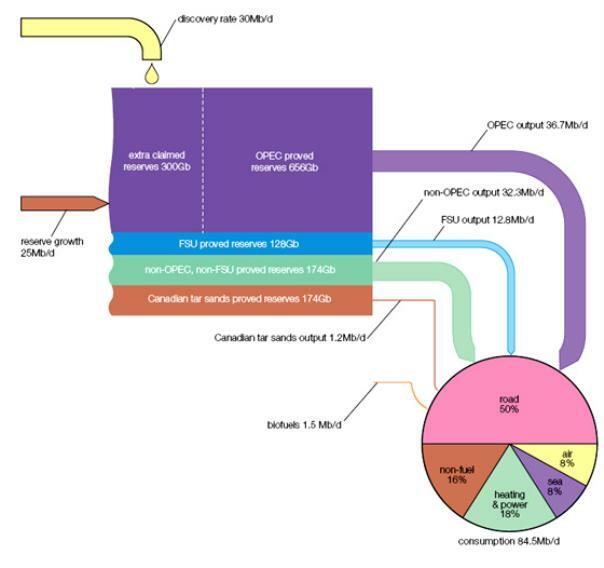 In theory, OPEC can utilise its spare capacity if demand gets too high, preventing price spikes. 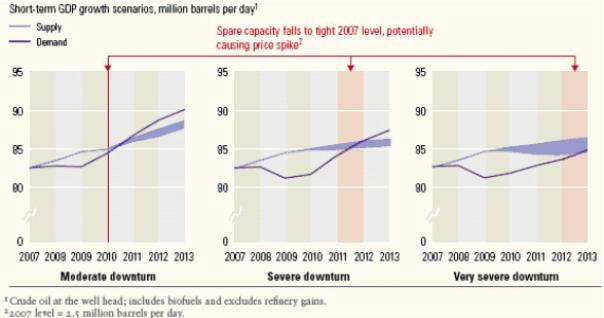 However, the true size of OPECs spare capacity is doubted by many analysts 14 and the 2004-2008 price spike occurred despite relaxations of OPECs quotas. The price of a product is determined by the price point where supply equals demand. The price at this point is the cost of producing the most expensive unit produced (plus profit). Newly discovered oil is rarely cheap to extract and is getting more expensive. It is typically in deep offshore reserves or unconventional deposits. These deposits are more expensive to extract oil from because they require additional inputs and special equipment. Refining oil from tar sands, for example, requires huge amounts of water and land, while deep sea drilling requires rigs worth over half a billion dollars each. Additionally, extracting unconventional oil deposits is often very carbon-intensive, resulting in greater cost as countries introduce carbon-pricing schemes. By keeping some of the cheapest oil off the market with its quotas, OPEC forces more expensive reserves to be used to meet demand, increasing the price of oil and their profit. The price of oil will continue to rise as the world is forced to turn to more expensive sources of oil for the marginal supply even if demand remains constant as low-cost reserves are exhausted and more expensive sources replace them. Cost driver 1: Exhaustion of low-cost reserves  as inexpensive oil reserves are exhausted, more expensive reserves have to be produced to replace them. There is no immediate danger of the worlds oil being exhausted. The problem is one of cost and of production rate. The production rate of any non-renewable resource, oil included, cannot increase indefinitely until the resource is completely exhausted. Rather, production will increase to a peak, and then begin to decline long before the resource is exhausted. Geological and infrastructure constraints mean that, as reserves of oil are used up and demand increases, oil production capacity will not be able to continue to expand indefinitely. An oil deposit consists of drops of oil in porous rock stored at high pressure. When an oil well is drilled into the field the pressure difference forces oil up the well to the surface and the pressure in the reservoir begins to fall. The oil reservoir is analogous to a shaken bottle of fizzy drink. Punch several holes in the top and the internal pressure will force the contents out at a maximum rate determined by the number and size of the holes. But soon the falling internal pressure causes the flow to begin to slow until it eventually stops with much of the contents remaining in the bottle. Oil companies can restore pressure in oil reservoirs by pumping down other material to replace the oil that is extracted but this is expensive and is only a partial solution. The bulk of the oil always remains in the ground and the extraction rate tails off at a predictable rate (the depletion rate) after reaching a high early on in production, as modelled in the graph below. We could think of a regions or the worlds oil reserves as a warehouse full of fizzy drink bottles of different sizes, pressure, ease of accessibility, and thickness of plastic representing different oil fields. The objective is to get as much fizzy drink coming out of the bottles at once as possible. Extraction logically starts with the biggest and best bottles, punching lots of holes to get the liquid flowing. The flow from the first holes starts to ebb away. The obvious solution is to punch more holes in more bottles to make up for the slackening pressure coming from each. That means punching more holes in lower quality, less accessible bottles; working flat out just to maintain current production let alone increase it. Eventually, the number of new holes that need to be punched and the declining quality of the remaining bottles mean it is not possible to make up for the reduced rate at which liquid is coming from the existing holes by making new ones. Total output will begin to drop. An International Energy Agency (IEA) study of the worlds 800 largest oil fields found that most of the biggest fields have already peaked and that the rate of decline in oil production is now running at nearly twice the pace as calculated just two years ago. 16 These oil fields are the big, easy to access bottles in the fizzy drink analogy. New production is not coming online fast enough to replace their decline and keep ahead of demand. While there is still plenty of oil in the reserves, the difficulty is extracting it at ever-higher rates. To do so requires more wells taking oil from less accessible and lower quality reserves. Nearly 65 percent of the worlds oil production takes place in 30 countries that are not democracies. 20 These countries tend to be less stable, increasing the chance of disruption to oil infrastructure. The large oil producers nearly all rate very poorly on the Corruption Perceptions Index. 21 Corruption is an obstacle to oil infrastructure investment in many of these countries. Man-made disasters like the Deepwater Horizon sinking can have similarly large ramifications. Along with the loss of the oil rig and the cost of the emergency response, the disaster resulted in a temporary ban on new deepwater oil drilling in US waters. All these infrastructure issues lead to greater expense and make adding to production capacity more difficult as oil production becomes increasingly reliant on less favourable reserves. The worlds oil production capacity can be known for several years in advance due to the long lead-in time required to bring new oil production capacity online and the known depletion rates of existing oil fields. As illustrated in the graph below, production capacity is being added at a declining rate due to difficulty in finding or accessing reserves and insufficient extraction infrastructure. Meanwhile existing capacity is steadily depleted. 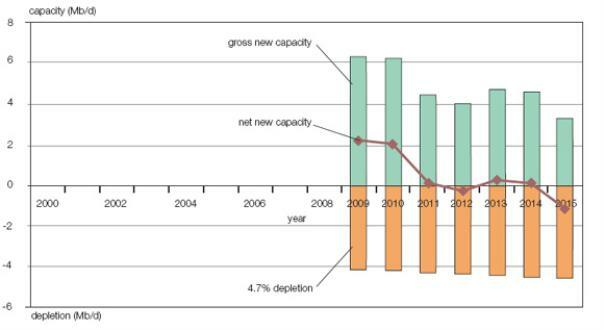 From 2011, almost no new net capacity will be added and there will be a total net decline of about 0.7 Mb/d in capacity between 2011 and 2015. 23 This means the maximum amount of oil that can be produced will begin to fall. This is not due to lack of investment. It is because remaining oil reserves are becoming more difficult and costly to access. The average size of new discoveries is falling meaning more wells are needed to extract the same amount of oil. More footage of oil wells are being drilled than at any time since the early 1980s exploration boom (sparked by the 1970s oil shocks) 24 and at greater cost but they are failing to find sufficient new oil to replace rapidly depleting production from existing wells and increase total oil production capacity. The projected track of global oil production capacity over the next few years effectively functions as a cap on global oil supply. The other half of the equation is demand. If demand rises to meet the cap on production, a supply crunch ensues. Cost driver 2: Increased demand  necessitating extracting more expensive oil, which raises the point where supply equals demand to a higher price level. Decreasing exports  due to increased demand in oil producing countries. The worlds excess oil production capacity compared to demand is central to determining the price of oil: the smaller the supply buffer, the greater the risk of short-falls. Markets factor in the risk of short-falls through higher prices. In a supply crunch, the difference between demand and maximum production capacity disappears (due to rising demand and/or falling production capacity), resulting in sharply escalating prices known as a price spike. Cost driver 3: Reduced supply buffer  when production capacity doesnt increase as fast as demand, the supply buffer decreases, which increases the risk of temporary or long-term short-falls in supply. Markets factor in the risk of short-fall through higher prices. The smaller the supply buffer the greater the risk that a small shock will cut production, at least temporarily, to the point where demand exceeds supply and oil buyers cant get sufficient product. A well-functioning market factors in risk: the smaller the supply buffer, the greater the risk of a short-fall, and the higher the price. Oil demand is relatively inelastic  i.e. consumers cannot quickly find alternatives to oil in sufficient quantities that allow them to carry on as usual if the oil price rises or supply is interrupted. Consumers have little alternative but to keep consuming. This forces consumers to cut down on other expenditure. It is also highly inflationary  consumers pay more not only for oil products but also for products that need oil products for their manufacture and transportation. Falling consumer demand and higher prices may lead to recession. Between 2004 and 2008 oil prices rose culminating in the 2008 supply crunch, where oil prices rose dramatically to USD$147 a barrel over twice the previous record of USD$70 a barrel set during the Hurricane Katrina disaster in 2005, itself a 30 percent increase on the previous high of USD$55 a barrel set in late 2004. 37 The price of oil and the financial crisis hampered economic activity to the point that the world economy entered recession. It was only when the recession caused demand for oil to ease that the supply crunch ended and the price fell. This may have been the first in a cycle of supply crunches and recessions following the same pattern: as demand rises faster than production capacity, the worlds oil supply buffer is whittled away. The supply crunch raises the price. Once the price reaches a certain level it tips economies into recession. This lowers demand, recreating the supply buffer, and results in a lower price. This enables economies to recover, which increases their oil demand, which decreases the supply buffer, and so on. Once production capacity starts to fall, rising demand will eat up the supply buffer at lower and lower levels. To put it another way, because oil is central to the global economy, the worlds maximum capacity to supply oil acts as a cap on world economic output, one that the global economy may hit repeatedly in coming years. Added to this is an underlying increase in the oil price due to the exhaustion of cheap oil reserves and their replacement with more expensive sources. There are thought to be potentially large, unfound oil reserves. A 2009 study by the Institute of Geological and Nuclear Sciences estimates that there is a 90 percent chance that reserves totalling 1.9 billion barrels of oil remain in New Zealand and a 50 percent chance there are 6.5 billion barrels. 46 Most of these estimated undiscovered reserves are in difficult to access deposits under deep water in the Great South Basin and the Deepwater Taranaki basin. In addition to petroleum oil reserves, New Zealand has a vast resource of lignite coal, which can be converted into petroleum products. Solid Energy and several other companies are proposing lignite to liquids plants or underground coal gasification projects to create oil products. 48 However, the IEA estimates lignite to liquids production costs are US$60-$110 per barrel, 49 so high oil prices are needed to make lignite to liquids viable. If New Zealand can increase its oil production, it could be a major economic boon in the long-run. The Ministry of Economic Development projects oil exports to reach $30 billion per annum by 2025. 50 However, becoming self-sufficient would require a massive increase in New Zealands oil production and refining capacity, and, as with any region, New Zealand would not be able to sustain high production rates as reserves were depleted. Indirect effects would be felt through lower consumer demand in the markets for New Zealands export goods, leading to lower prices. Tourism Businesses: face an increase in their operating costs due to higher oil prices and reduced demand in response to oil shocks and price increases. Destinations and communities: face reduced visitation resulting in compromised regional development. Tourists: reduced experience due to higher proportion of holiday budget being spent on transportation. As a country that is reliant on oil imports and heavily dependent on cheap oil for its major sources of income, New Zealand is highly exposed to oil shocks. Domestic oil production is insufficient to meet New Zealands oil needs. Equally, increasing domestic oil production would not protect New Zealand from either the direct or indirect effects of price spikes caused by global supply crunches. Although there remain large reserves of oil which can be extracted, the worlds daily capacity to extract oil cannot keep increasing indefinitely. A point will be reached where it is not economically and physically feasible to replace the declining production from existing wells and add new production fast enough for total production capacity to increase. Projections from the IEA and other groups have this occurring, at least temporarily, as soon as 2012. The difference between the global capacity to produce oil and global demand is the supply buffer. When the supply buffer is large, oil prices will be low. When the supply buffer shrinks  due to demand rising faster than production capacity or production capacity falling  prices will rise as markets add in the risk that supply will not be available to meet demand at any given point in time. 04 Using IMF world GDP data http://www.imf.org/external/pubs/ft/weo/2010/01/weodata/index.aspx and BP world oil consumption data http://www.bp.com/subsection.do?categoryId=9023761&contentId=7044545, from 1980 to 2008 a correlation of 0.7 is found. Numerous other studies point to the relationship between oil use and GDP growth. Except for educational purposes permitted under the Copyright Act 1994, no part of this document may be reproduced or transmitted in any form or by any means, including information storage and retrieval systems, other than by Members of Parliament in the course of their official duties, without the consent of the Parliamentary Librarian, Parliament Buildings, Wellington, New Zealand.This document may also be available through commercial online services and may be viewed and reproduced in accordance with the conditions applicable to those services.